Diary of an Incompetent Soprano: [title of show] is the title of show?........My brain hurts. A blog about singing! All singing! Opera, classical, pop, jazz, buskers, professionals and amateurs. Written by me, corrected by, I mean edited by my sister, Katherine Platt. [title of show] is the title of show?........My brain hurts. I have never been to the Landor before. For those not totally au fait with London's fringe theatre venues, the Landor is a pub in South London near Clapham North station that has converted an area upstairs into a theatre. It is a popular ploy in these depressing economic times to do such a thing and, although some of these venues have been around for for a while, more and more are popping up. So, Thursday night's offering was the musical "[title of show]"and was the 2nd preview showing of the London premiere of the show (they were beaten to the UK premiere by a matter of days as there is another professional production going on right now at this year's Edinburgh Fringe Festival. I say right now, it depends when you are reading this as to whether or not they are performing right now). I should point out that, as I write, I am sitting in Purley's branch of Costa where I have just received the toastie I ordered. I have a huge addiction to their Emmental and mushroom toastie so I was looking forward to treating myself whilst I write, what is bound to be, a thrilling diary entry. Unfortunately their fridge is broken so I had to ask for the toastie I wanted at the counter and the barista went to get it for me from some other, working, fridge. Imagine my dismay when the sandwich brought to me was not filled with delicious Emmantal cheese and mushrooms but boring old cheddar and tomato (I could make that at home). I am not happy but, me being me, can not muster up the courage/will to take it back. I will try my best not to let it cloud my opinion of what I thought about the show. For those who do not know the piece (which is probably a fair few of you; I know I didn't) it is a musical about writing a musical. Jeff and Hunter want to write a musical to enter into some musical theatre competition and as they don't know what to write about decide to write about writing this particular musical for the competition. Their day to day lives become the subject and everything they do and say is included. It is a quirky and clever concept handled superbly by the 4 actors and the MD (just in case some non-musically minded people are reading this, and not meaning to be patronising, MD is musical director not medical doctor or some other job with the same initials). The first hour is an absolute joy but the last half hour feels a bit laborious and as if the writers didn't know how best to get to the ending. As everything the actors say is part of the musical there really is only one way it CAN end but I won't spoil it (actually it could end with some Apocolyptic event but I think that would be a step too far). The thing I really loved about the whole experience was the sound (and as this is a diary about singing this is exceedingly fortuitous). The actors did not have mics so, for a change, we could hear the true tone of each singer's voice. The space is of a size that means, I imagine, mics are not often used and are unecessary and it was so refreshing to see a show, a musical no less, where the singers had no "help" and yet every single word was delivered with crystal clarity. I can honestly say I heard everything and it was all fabulous. It is such an intimate space but the actors managed to help us, as an audience, feel incredibly comfortable and like we were part of the writing process. The only criticism, as I mentioned earlier, was with the development of the last section of the piece but the actors did their absolute best to keep it fizzing along. As there were only 5 performers, I will name (but not shame) them; Simon Bailey, Scott Garnham, Sophie Ragavelas, Sarah Galbraith and, MD, Michael Webborn (who was allowed to speak and even had a character name). I can not single any one performer out as the show would not have worked as well as it did if any one of them had not been there (having said that the "Blank Page" character, performed by Scott Garnham, was one of the funniest things I have seen in a long time). The show is on at the Landor until the 14th of September and is well worth a look if you have the time and opportunity. Oh, btw, the cheese and tomato toastie was scrummy but will never hold a candle to the Emmental and mushroom. Still under the Spotlight.....for now, at least. Another milestone reached and what do I want to talk about?....John "flipping" Rutter. A girl can change her mind! You gotta get a gimmick.....no wait, do you? 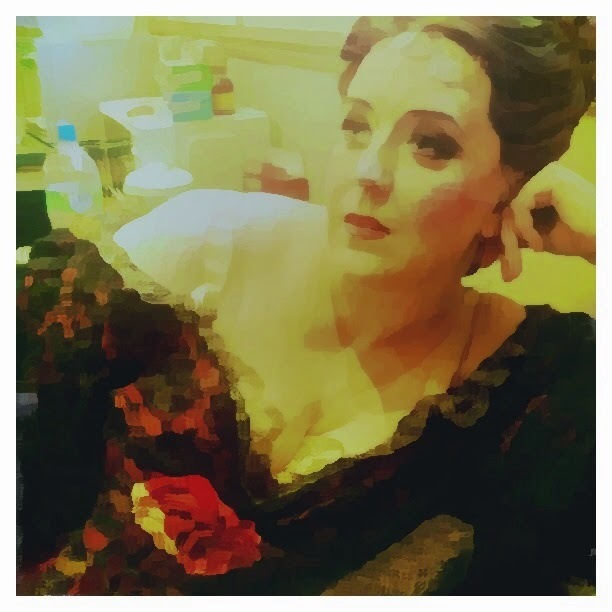 Confessions of a lazy soprano. Diary Entries direct to your inbox! Never miss a post. Content remains the property of Claire Platt. Ethereal theme. Powered by Blogger.